You can prepare other ingredients while rice cooks, then fill the rice container with hot rice, then sprinkle with black or white sesame seeds. Clean, dry and shred the lettuce. Fill the bento container with it, then place slices of a tomato, sprinkle with some salt and dry herbs. Drain the tuna in a strainer to remove the moisture. You can flake it with a fork to remove stuck fluid. Move to a bowl. Gradually start adding mayo to achieve consistency you like. I liked mine smooth, so I added around 2-3 spoons for the whole tuna can. When you're happy with the consistency, you can add around 1/4 teaspoon of salt, pepper, and 1/2 teaspoon of herbs. Mix everything up. 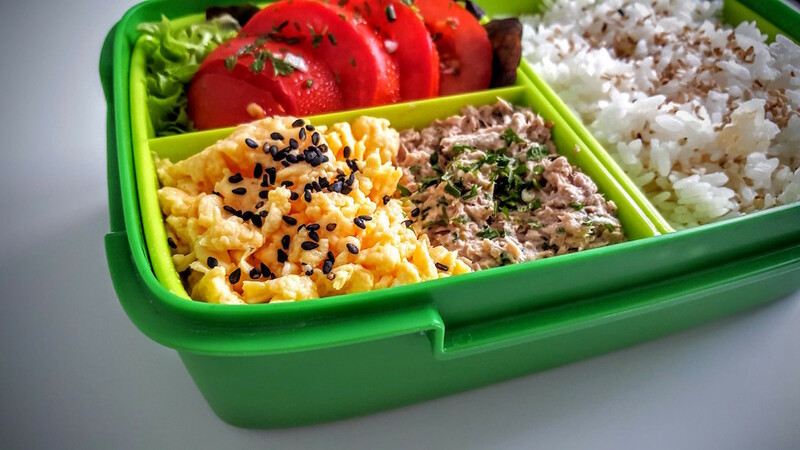 Place tuna in the bento container and shape it with a fork to leave some space for the iri tamago. You can sprinkle it with some dried herbs. In a small bowl, mix 2 eggs (or a teaspoon of sugar) with mirin, and a pinch of salt. Fry on a medium-low heat stirring constantly to form cooked lumps of egg. If you used mirin they will be moist, but should be yolk-yellow and without any uncooked egg. Fill the remaining space in the bento container, sprinkle with black sesame seeds or some dried herbs, and your bento is ready!